Former Nissan chairman Carlos Ghosn has maintained his innocence in his first court appearance since his arrest in Japan last year. He has been in custody since November and faces allegations of financial misconduct. In a prepared statement, Mr Ghosn said he had been “wrongly accused and unfairly detained”. His lawyers requested the court hearing to address the reasons for his lengthy detention. 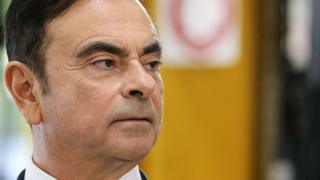 Japanese prosecutors have charged Mr Ghosn with financial misconduct and accuse him of under-reporting his pay package. Mr Ghosn, a towering figure of the auto industry, appeared at the Tokyo District court wearing a dark suit and appearing thinner. “I have been wrongly accused and unfairly detained based on meritless and unsubstantiated accusations,” his prepared statement read. The 64-year-old was expected to tell the court he never received any compensation from Nissan that was not disclosed. Mr Ghosn said he had “never been accused of any wrongdoing,” and had dedicated two decades to “reviving Nissan”. His initial arrest nearly two months ago shocked the industry and his lengthy detention has drawn some criticism. But a judge in the Tokyo District Court on Tuesday said Mr Ghosn’s detention was justified as he posed a flight risk and the risk of evidence tampering, according to reports. The architect of the Renault-Nissan alliance has been accused of “significant acts of misconduct”, including under-reporting his pay package and personal use of company assets. His defence team say the accusations against him are invalid because they do not relate to his salary, but to future payments that he was expected to receive after retirement. Experts do not expect much to come out of Tuesday’s hearing. “After the hearing, his lawyers will likely request to cancel his detention. But there’s no chance it’ll get approved,” Yoji Ochiai, a lawyer and former prosecutor in Tokyo said.